Sunday night's air strikes in Syria targeted weapons storage sites, an Iranian intelligence site and an Iranian training camp. 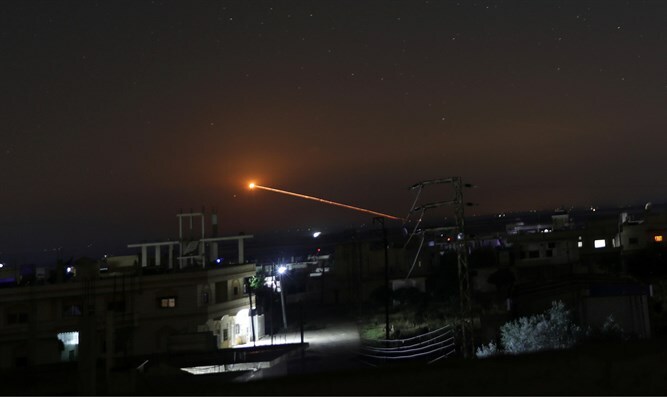 The IDF Spokesperson’s Unit said on Monday morning that the IDF air strikes in Syria overnight Sunday targeted Iranian Quds Forces military targets in Syria in addition to Syrian aerial defense batteries. The attack on the Quds Force targets was carried out in response to the launching of a surface-to-surface rocket that was carried out on Sunday by Iranian Quds forces operating in Syrian territory into Israeli territory and was aimed at the northern Golan Heights. The IDF's Iron Dome aerial defense system intercepted the rocket. The following military targets were struck as part of the IDF's attack targeting the Iranian Quds military sites in Syria: munition storage sites and a site located in the Damascus International Airport, an Iranian intelligence site and an Iranian military training camp. During the strike, dozens of Syrian surface-to-air missiles were launched, despite clear warnings to avoid such fire. In response, several of the Syrian Armed Forces' aerial defense batteries were targeted. “In firing towards Israeli territory yesterday, Iran once again offered definitive proof of its real intentions of its entrenchment in Syria, which endangers the State of Israel and regional stability,” said the IDF Spokesperson’s Unit. “In addition, the IDF holds the Syrian regime responsible for everything taking place within Syria and warns the Syrian regime against targeting Israel or permitting it to be targeted,” it added. The IDF is prepared for a wide variety of scenarios and will continue operating as needed in order to defend Israeli civilians, the statement said. For the time being, the Mount Hermon ski site will not open for visitors on Monday.